He gets into the car, starts talking to me, grabs the water bottle that is sitting in the console, opens it, takes one or two sips and proceeds to chew the lid until it is no long round in shape but almost like a small, white, plastic taco. And by chew, I mean really chew. This is not something new for him. He is a “chewer.” He chews on the collar of his shirts, the lids of water bottles that squirt, the corner of blankets when he is watching TV and more. I must say that our conversation each day in the car after school involves me saying “take the lid out of your mouth” at least twice. It would probably be more but we live only a mile from the school. He has a basket of alternative items to chew to give him the input he is craving. I even put out gum but there isn’t really “one thing” he will grab to chew. Usually we will pry an item out of his hands and insert one of the alternatives, until this wonderful item was introduced to Michael…..and its name if CHEWIGEM. This chewy pendant is shaped like a rain drop, is on a string necklace and is simply wonderful. Trust me, we have purchased other items like this but I think what makes this so great is the consistency of the pendant. It is not rigid. It allows for Michael to use it without feeling discomfort, which is what he said about the other ones. It also bends. Which means he can chew it flat or fold it and chew it for more input. He woke up this morning, came into the kitchen for a hug, then went to the basket to get the CHEWIGEM and sat on the couch to watch some TV. He really, really likes it. Michael is a typically developing child, who has a need for this kind of input. So I am so happy there are things out there for him. But I know that so many of our special needs children, especially those who have Sensory Processing Disorder(SPD),may crave this kind of input. I know these items would be a good fit for them. Another nice thing is that the lanyard has a break away clasp on it so if your child chooses to use it as a necklace, to keep it with them, you can be sure that they will not be choked by the lanyard. You will have to keep in mind the age and development of your child to fully gauge the choking hazard of the pendant itself. It is also safe to chew as it is BPA free and I cannot say the lids I talked about before are. It is also fun to play with because of its texture and that it is so bendable. It can be used as a fidget too! With the holidays upon us and stress riding high, maybe not such a bad idea to get one to offer to your special needs child at this busy time. Or if you are like me, to your child who is currently chewing on a bottle lid. In any event, take a peek at our site to read more and see if it is a fit for your world. I know ours is!! Colorful, safe play mats offer many important benefits for early development in babies and children. That’s why we stock a variety of play mats with interesting textures and shapes. An early development essential, play mats are one of the most versatile products on the market. They encourage children to develop fine-motor skills, visual sensory development and hand-eye coordination. Play mats also teach valuable logic and reasoning skills. Plus, they are a fun way to spend parent/child bonding time working on communication and sharing skills. Play Mats are specifically designed to be educational and encourage child development. Most mats have interactive features like removable puzzle shapes, fun tiles and different sights and sounds. Well-designed play mats encourage children to develop fine-motor skills, visual sensory development and hand-eye coordination. They also contain vibrant floor tiles designed to encourage child’s logic, reasoning and motor skills. Children learn to recognize letters, numbers, animals, shapes and colors. Play Mats, like the Play Mat – 6×6 Foam Letter Puzzle (36 PC), feature alpha-numerical tiles to encourage number and letter recognition. Playmats incorporate bright colors and a variety of textured surfaces to engage your child for hours of discovery and play. These features provide your child with important sensory experiences. Your child will enjoy touching varied surfaces, removable puzzle pieces and friendly animals. Some play mats incorporate music or crinkly fabric that makes noise when a child interacts with it. Play Mats provide a soft, safe and colorful play space for the home, school or office. Our mats have all been tested for safety and made by award-winning brands like EduShape. They are made from non-toxic eco-foam that is hand washable, durable and great at insulating cold floors. Our play mats, like the Play Mat 3×3 Foam Floor Tiles, feature easy grip play and skid resistant bottoms. Our play mats are recommended for children ages 3 and up. They are not recommended for children under three due to a choking hazard associated with small parts. Great in any home, play mats also make traveling with your child a bit easier. They allow you to set up a safe, comfy space anywhere, and the colorful tiles and textures help entertain children for hours. Most playmats fold up or break down easily for excellent portability. When you return from your travels, give them a quick wash to remove any germs or grime to restore their condition. These play mats are hand washable for your convenience. One savvy parent just washes them in the tub for easy clean-up without the mess. 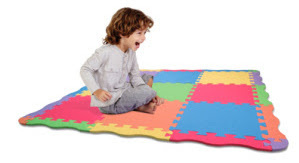 Suitable for toddlers and children, play mats are adaptable for years to come. They are perfect for day care centers, play rooms, nurseries, and playgrounds. Play mats make great gifts for birthdays, holidays or baby showers. Though playmats are perfect for infants and toddlers, older children can appreciate baby gyms and the different toys for the sensory experiences they offer. Want to tell us about your favorite use for a play mat? Drop by our Facebook page and leave us a note! Special Needs Essentials promotes awareness and facilitates support of families and professionals caring for a person with special needs. For more information, please visit our website.